A guide to pruning hebes and hebe care. 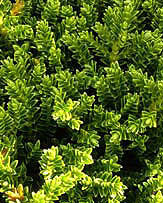 How and when to prune and fertilize hebes. Hard pruning and shaping plants for the garden and landscape. We often read than hebes need no pruning or very little pruning and feel that this must be written by people who have never grown hebes, or have maybe never seen one. And yes on the labels they say, easy care, little pruning and other 'buy me comments', but they are trying to sell plants remember. So yes they do not generally need an extensive amount of pruning however without proper care, each year, they will become a little straggly and loose shape. Once you let then get out of control they can be difficult to get back into shape. And the best time of the year to prune them is in spring. 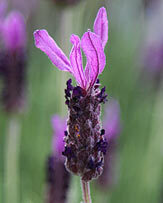 We also have hardy, and less hardy Hebes, the less hardy ones will need to cut back each year. 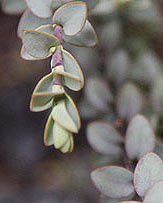 Generally speaking those with smaller leaves will require less pruning than those with larger leaves. 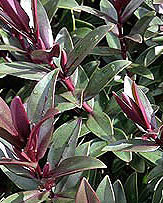 Ideally you would look at the plant early in spring and see if you need to remove any damaged branches. The best time to actually PRUNE to shape is after flowering. So when we are deadheading we also shape. In the UK with cold winters it is best not to prune too late in the season, give new growth a chance to harden off a little, so if you must, late summer at the latest, unless you live in a warmer part of the country. Hard pruning is another example of misinformation, we have read that you can just cut them back to around 25 cm and they will regenerate, more likely you will kill the hebe. Hard pruning should be done over a period of time, cut back sections to a bud, 1/3 of the bush at a time, give the plant time to start new growth before starting on the next section. 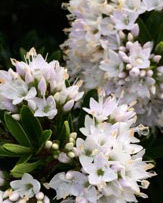 Hebes generally need a little pruning each year, the following procedures can be carried ou t to help care for, and sucessfully prune and maintain hebe plants. Remove any dead or frost damaged stems or branches in spring or as they appear. Wait until a bud forms and cut back to the bud. 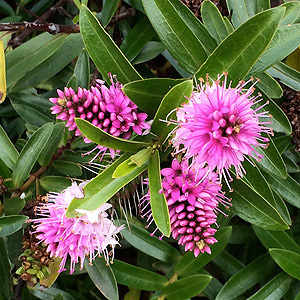 Lightly prune hebe plants in spring to maintain shape. 'Deadhead' or removing spent flower heads will help prolong flowering and maintain appearance. Hebes are not heavy feeders so require fertilizer only once a year during spring. Try a top dressing with manure, or perhaps a liquid fertilizer at this time.